Welcome to my latest development called Bumblebee – an Excel and Dynamo interoperability plugin that vastly improves (in my opinion) Dynamo’s ability to read and write Excel files. This development would’t happen without help and previous development from David Mans at NeoArchaic, of which this Bumblebee not only takes its name but a lot of inspiration and code. The plan is that eventually improvements and changes that were implemented here will find its way to Grasshopper’s version of Bumblebee and they will become one. Until then, Dynamo users rejoice! Most basic functionality that Bumblebee (BB) will support is reading Excel files. It allows for reading either an entire document or a specific range from it. Ranges can be created in a variety of ways where you can choose an origin and extents or only either origin or extent. Each way has its unique advantages for users and in general offers a lot more flexibility than OOTB Dynamo Read Excel node. You can even read more than one Worksheet at the time. Awesome! Besides extended reading abilities, BB was also well educated in writing. It can write data to single sheet but also to multiple sheets as well as to single sheet but starting from multiple origin points. What was previously not possible – leaving blank rows while writing data – is now very much possible. All of this enhanced writing abilities comes from the idea that you can send “pockets” of data to excel and define an individual origin or even a sheet name for each. All this is done using a new class called BB Data so you can do stuff like this and write multiple sheets at once. Double awesome! Also, BB now supports an array of conditional formatting styles. 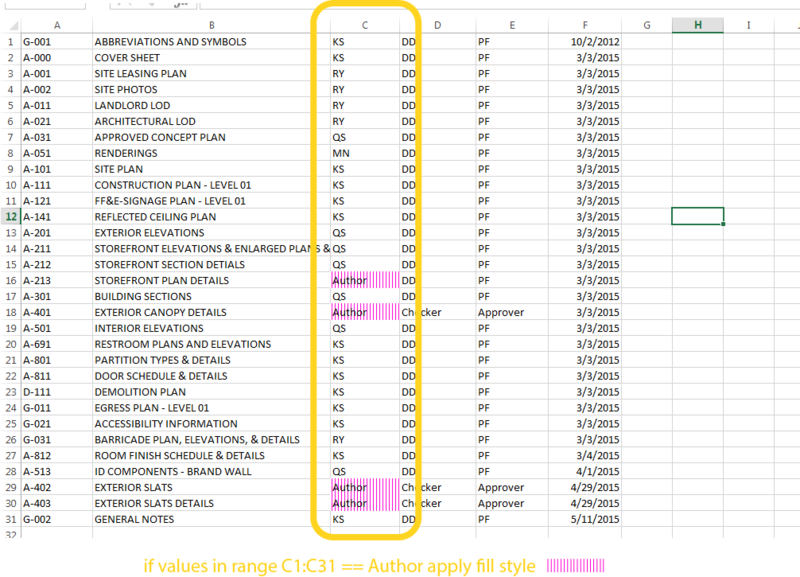 For those of you that use Excel extensively you know that you can really quickly use formatting styles to highlight certain aspects of your data sets. Now you can set formatting rules right from Dynamo and do some amazing things – highlight missing information or incorrectly provided information. Now, that is pretty cool if you ask me. Finally a tool that I can use to visually verify my data and keep my Excel loving PA’s happy. Also, I am super happy with something that a friend of mine – Adam Sheather – has developed as courtesy to me. I asked him if it was possible to improve the currently available color selection in Dynamo and he has responded with the coolest (1990s Excel style) Color Picker. Now packaged under UI++ will come super handy for Bumblebee users and many others – especially now that Dynamo supports color preview. Thanks Adam! Of course this is not the end of Bumblebee, this is only the beginning. I am releasing it now to public so that more of you can get your hands on it, and break it. Yes, I hope that you break it, only so I can improve it. It’s an open source project with all source code available on GitHub: BB GitHub, so I am hoping that all of you can contribute as well. Please feel free to post comments and issues to GitHub as it makes it easy to track development and tasks. Also, Bumblebee Primer is an Open Source project with all of the files on GitHub. Same rules apply here. Please feel free to post comments there or develop new functionality. Right away I can say that my next development will be adding Charts to Bumblebee, but before I get there i will probably be working on material for my ACADIA workshop. :-) I will provide more details about that as everything crystallizes. This is great! It will be especially helpful for a project that I am working on where I am trying to create a whole bunch of search sets using excel sheets as the input. Next step: trying to figure out how to make my custom “create search set” node. What is it that you want to search for? There is a node in Bumblebee called Search Value Get Row that will search for a first matching value and will extract an entire row that this value was found in. This might be handy in the context that you are describing. Sorry, should have been more clear. I need a node to create a search set in Navisworks. Well, you posted that question under Bumblebee write up so I assumed that you were asking about Excel. When it comes to Navisworks, I have no idea. I am sorry. This is Adam Sheather question. He’s the expert. Try using BIM Cave Auto search. It’s a free add on for Navisworks. Thanks for sharing your awesome work! I was just testing it out, but i cant seem to get the write excel to work! i’m following your example, and then trying to feed the BB Data’s data inpunt with a list of room areas. When i run it with my excel file open i get an error (see attached) but when i close the excel and then run the dyn. it goes through, but it erases all the excisting data in the worksheet. Cant figure out where i’m goinig wrong, hope you can help! I replied to you via email. Just to make sure that everyone else gets the response I am posting it here. I removed the “clear content” functionality when overriding already existing excel files. I assumed that you would want to clear all before writing a new set of data. Instead i will be publishing a new node for that. The issue of having to close excel to write. Yes, that is the case at the moment. I will be publishing a new node that will allow you to override live/open files. shame on me, I haven’t even tried the package, but just read your post and want to know if you can read / write a key schedule? Firstly, I’d like to say a massive thank you and give a “high five” for your work to date. It has saved me, and countless others massive amounts of time, while making Revit even more practical and enjoyable. Secondly, I’m using your Bumblebee nodes. They work great, however I’m wondering if it’s possible to read and write to / from excel at the same time without causing a circular reference / loop. I change the “Width” parameter in Revit. Using the Bumblebee Live Write Excel node, the “Width” updates in Excel. I then change the “Width” value in Excel. 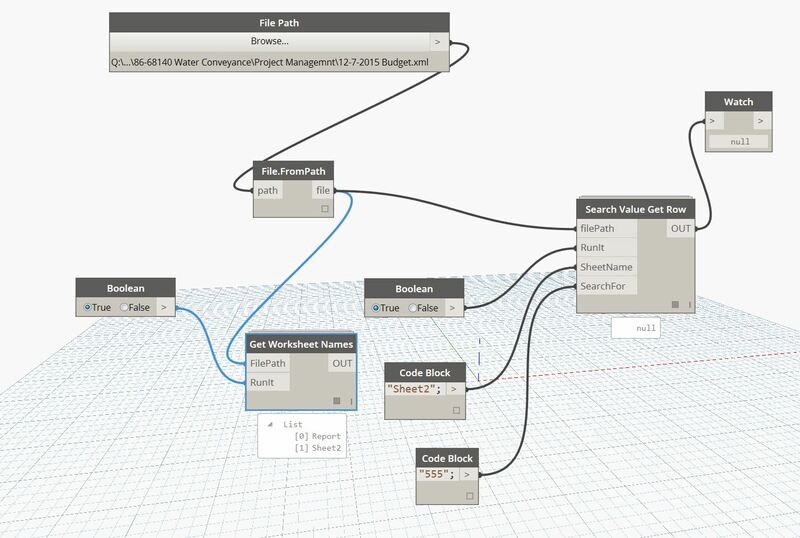 Revit updates the “Width” parameter using the Bumblebee Read Excel node. I’m not sure if this is possible but it would make my current much more practical and streamlined. I plan on running it in automatic mode. It sure is possible. I will try and have a look at that this week. Stay tuned. Did you get that process to work? I have the exact same hopes and dreams as Andy. 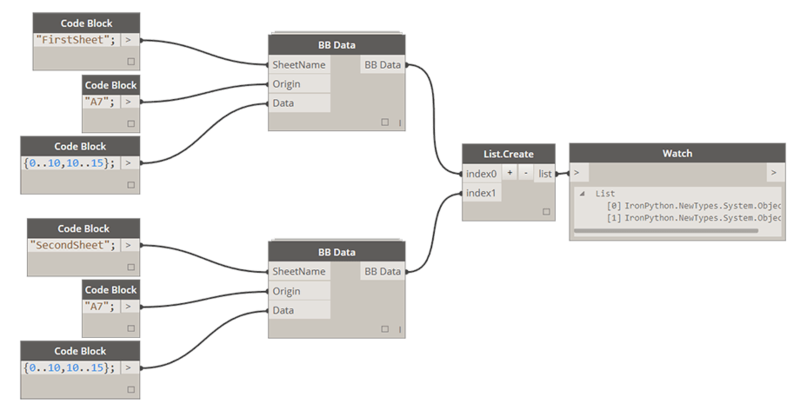 I can’t get the BB node to work with a newly specified sheet name. It works if I choose an existing sheet name or default sheet name (Sheet1) but not if I specify something else. Great tool but i could use some help with this. Care for an image with the set-up / error? I will try to help you but i will need a little more info. This seems to be working fine on my machine. When I specify sheets that already exist in the xlsx it works. I’d like to generate the names new and not have to rely on there being an existing xlsx with sheets. ALSO, since I have you, is it possible to write to two write nodes, one specifying by column, one not by column, but both referencing (using) the same xlsx doc? It was working but now it seems to be a little broken. Thanks for your help. Great Package! Please update Bumblebee to latest from Package Manager. It has been updated recently with new functionality. This might have been fixed. You probably don’t want to write to the same document at the same time from two different sources. Just like with regular Windows UI it would tell you that a document is already open and will offer the “read only” method. I can suggest that you put a time delay on your components so that one doesn’t start until the other one already finished. You can probably use Function.Compose for that. First off I think this package is amazing and am continuously impressed by your work!! This is probably a silly question but I can’t find an answer anywhere. What I want to do is apply a Graphic Style, specifically a text style but my excel document wont update with it. I tried combining the function with the BB Data node but that created an error. See attached. You can see that I disconnected filePath from FormatExcel node. It’s because if you don’t supply a path it will format a open document. This works in “live mode” this way. Of course you can close Excel and give it a filePath to format it that way. Good luck! I’m currently using the most up to date version of your excellent bumblebee package (2015.10.12). What I am trying to do is write 8 different lists to a single excel sheet. If I collect all of the lists into one large list using List.Create and pass that master list through BB Data, everything works fine. But If I try to pass each sublist through their own BB Data node first, and then do a List.Create, I can an error. In some of your examples I’ve seen the data being written to excel handled both ways. So I’m just curious as to what I am doing wrong. Yes that is exactly what my graph looks like… just more complicated. And I repeatedly get the error message as an output. I’ve attached the file for your review (if you have time!). it appears to work just fine if the excel file is already created. But using the setup without the file already in the specified location it fails every time. Interestingly, if you create a list of the data and then pass it through the BB Data node it will create the excel file just fine. You are doing couple of things wrong. First I think I mentioned in the Bumblebee Primer not to use the Get Worksheet Name and Read Excel nodes together like that. They are both trying to access the same session of Excel and will cause errors. Also, I think that SearchFor input accepts a list of strings, instead of a single one. I might be wrong about that. Thanks for the help. I’m still getting a “null” value after removing the “get worksheet name” and creating a list of strings. See attached image. Any other ideas? I’v check spelling and caps. Can you share that Excel file? Also, learning how to debug properly will help you greatly in the future. All you have to do, to see what the error message is: Double click on the node, copy/paste the Python node inside of it back onto the canvas. Now you can wire up the Python node, just like you would the custom node, but it should return the error message. This might prove invaluable when working with Dynamo. File was to big to attached. Ill see about this in the morning. So nice of you to help. Thanks again. 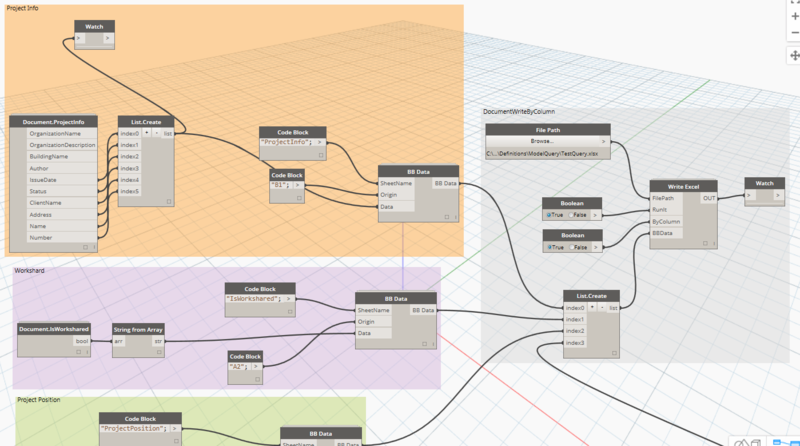 Are you on Dynamo 0.9? I haven’t updated Bumblebee to 0.9 yet, so naturally it’s looking for a file that might not exist (or exists in a different location). The way to fix that is to go inside that Python node and change this line from 0.8 to 0.9. I am trying to export Schedules to Excel. 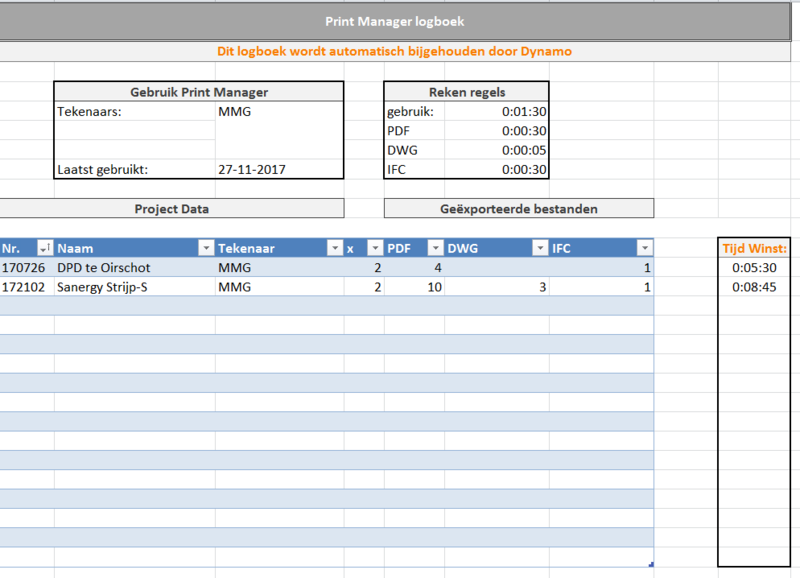 I want to export the schedules i have already created in the Revit project out to Excel and cant seem to get it to work. Any ideas? Yeah you can go to File>Export>Reports in Revit. No Dynamo needed. Yeah, i was wondering if i could use Dynamo to do this. Doing it the manual way is very tedious when i have a lot of schedules in the project. I was hoping to be able to automate the process without the use of other addons. Has anybody found a way that I can insert an Excel schedule directly in Revit. I do not want this schedule to be linked to any Revit elements. Any comments are greatly appreciated. Yeah there is a way. You can use a tool called Sticky by Imaginit. If you don’t want to spend money on it, you can code it up yourself. I will tell you that it takes some fancy cell splitting in a key schedule. :-) good luck! Hi, I am trying to write a number of lists to excel using your bumblebee write excel nodes. 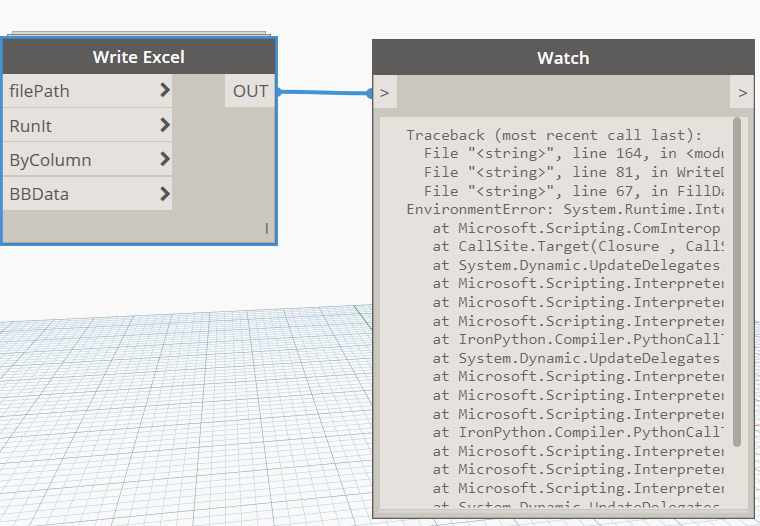 The live write node works perfectly as expected but using the write excel with file path node always return “null”. The file path link links to an existing file and I have tried running with and without the excel open first. Do you have any suggestions why it may not be working? please download the latest Bumblebee package from the Package manager. I apologize for it but I had a small typo in my code last time I posted an update to Bumblebee and that’s whats causing this error. Have you experienced a situation where you upload bumblebee and the live.write.excel node is not within the package? I’ve managed to download the complete package on my desktop computer, but when trying to install in a laptop the node is missing. Both – desktop + laptop – have the same versions of revit  and excel . Well, for some reason the live write excel.dyf was not transferring during the download on my laptop. I fixed the problem by transferring the dyf file from my desktop to my laptop. 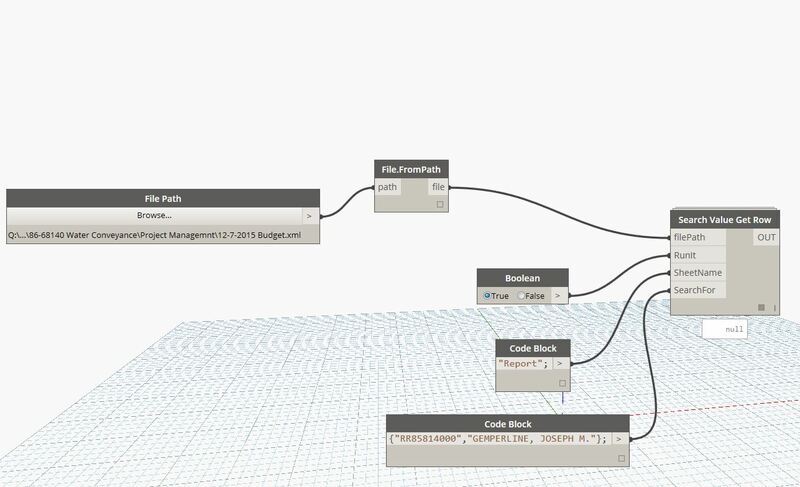 Now, the node is in the dynamo package on my laptop. Great work, by the way…. I think that I have discontinued this node in the latest build of Bumblebee. Right now, you can “live read” an Excel file using the regular Read Excel node if you don’t provide filePath input. It will automatically check for an open session of Excel if there is no FilePath input provided. I tried installing BumbleBee this week for Dynamo build 1.0.0.1180 and the DLL is not included. Thru a thread I found on dynamobim.com other users said they had to install a 6/15 build to get it to install so I followed suite. This was the only package that would work on gethub! After messing around some, and playing with my new BB nodes, they’re simply not passing data. Output of anything with a BB is Null even when just pushing strings. (I have your exact screenshots from this site shown, my data tabs all say “Null”. I cycled all of the Booleans between true and false, nothing matters, nothing different regardless of the “RunIt” node or “by column” and the result doesn’t change at all. 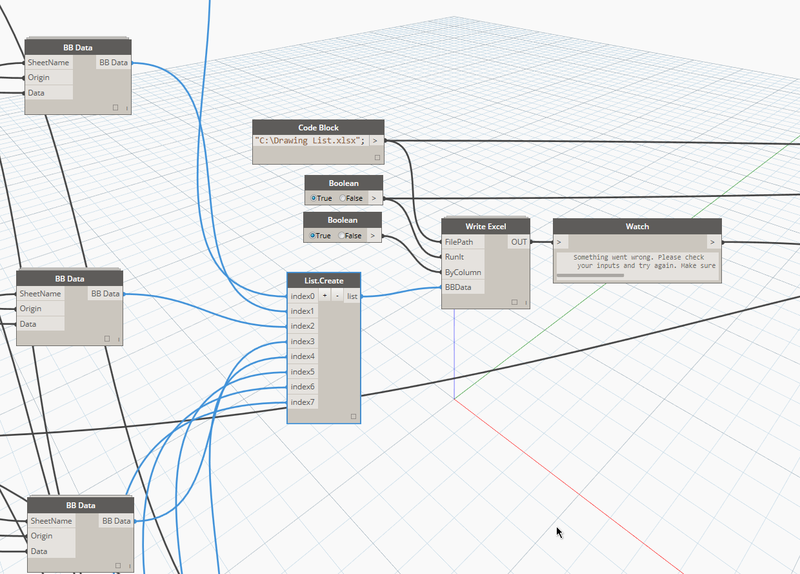 Don’t mind the mess of the included screenshot, lots of Dynamo going on around the test nodes for BB. All nodes, including Dynamo build # is shown in the capture. With Dynamo 1.0, you can’t install any of the versions of Bumblebee made this year! I had to install the oldest package still available (6/15) to get the nodes available. All off the BB nodes are not passing data, Null output even building the simple test you show in your explanations. I attached a screenshot (Don’t mind the mess around the BB test, I’m hoping BB can offer a solution to my “Write to Excel” that can either write a table, or at least preserve a table and write to the cell value. Current Dynamo node to Write to Excel with Overwrite values on physically deletes the page, and any formatting, or hidden formulae in the cells. Latest build of Dynamo (1.0.0.1180) will not install the latest version of BumbleBee. 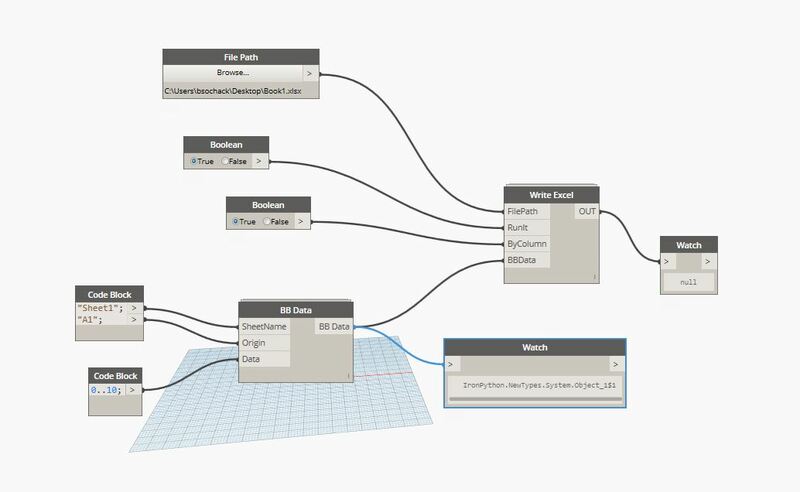 Thru tips on dynamobim.com people are using the 6/15 build as the only functioning build! Well with 6/15 installed, none of the Bumblebee nodes work. Even with the test example you show above, the outputs of all the BB nodes are null. (I’ve tried uploading an attachment of the screenshot attached, but the website has errored/failed on my post 3 times now with an attachment. I can email you more info if you’re interested, but there’s no link to email you, or the webmaster I could find either. Jason, please relax. I will update that package and fix all of the issues when I am back from my travels overseas. Big fan of your work. I know you can generate new excel sheets within a single excel book, but I was wondering if your package has the capability to create an entirely new excel book? I would like create a new excel file each time I run, but not overwrite old data, and would like to build this step into Dynamo if possible. My hesitation with creating a new sheet in the same excel file is that the excel file will quickly get very large. Have a look at the node called “New File By Template”. It’s not doing exactly what you need, but I think you can make small changes to it and get it to work. Good luck! I am running into the attached error on this block. Also, the block is writing a unique file for each letter of the file name, rather than one single file with the full name. Not seeing what I am doing wrong. Never mind, I realized it was looking for a list not a string. While trying to write something into an excel the “write excel” node gives back that “os is not defined” (line 138). I tryed several versions of bumblebee now, getting back the same erorr again and again. May you please help me to fix it? Would also like to know the solution for this. 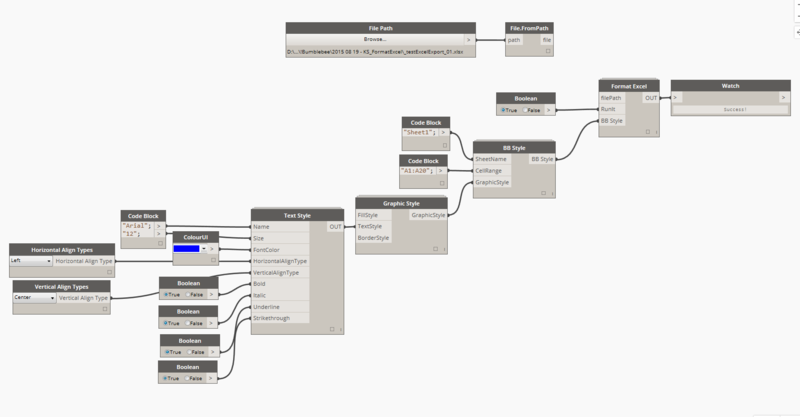 Latest build for Dynamo 1.2 does work with excel 2007 which I have on my laptop but works fine when I’m in the office. In fact they don’t work using read excel ( from the office node) either. 1.2 seems to not talk to that version of excel. I haven’t had a chance to develop for Excel 2007. Last and only version of Excel supported is 2014. Hi! I’m looking for a way to populate a table or matrix of data being pulled from Revit to Excel. I’m trying to achieve a table with the number of condo suites of each type (columns) x floor level (rows) table. The suite types include Studio, 1 BD, 2 BD etc. When I try to achieve this through Dynamo, if my Revit model has no 2BDs on Level 2, there is no field created to generate a “0”. What is worse is that as the project progresses, if the number of 2BD suites on a level changes from 1 2BD to 0 2BD the lengths of my lists change and all my mapping from Revit to Excel gets completely scrambled. Is there anything in BB that could help deal with data gaps or conversely match one specific data field to the right spot in the matrix? Great work, thanks a lot, just one thing… I can’t see the Condition Value Type node? Has it been depreciated? Have you seen this: https://konradsobon.gitbooks.io/bumblebee-primer/content/320_cell_value_formatting.html I think they should be under Types. I might have renamed it at some point. loving the Bumblebee nodes and they are working great but I am seeing the excel services are not closing in the background after close and in instances of opening similar files its using the temp info instead of reading the file. Is it possible to change only particular cells in excel and than save it with new name. I was trying to use “New File By Template” however I cannot make it work. Hey Konrad, thanks so much for the great tool. Getting into using it with Revit 2018 and Dynamo v 1.3.1.1736 and am getting the following error, see attached image. I’m not familiar with attempting to debug the python code but was hoping you could help clarify. The goal right now is to simply extract data from Revit Elements of a single category and write the parameters as the column headings and the values in the rows below. Nothing too crazy when creating my lists supplying the BBData input. Let me know if there is an easy fix. Cheers! Hey Konrad, this package is amazing so far. As you can see in the attached image i’m using your nodes in our custom company Dynamo scripts to automatically log the usage of our Tools. This log is going to be a template to log all our tools. Hopefully this is achievable. Thank you for all your work so far! This is a great package, very useful! – I’m trying to write an excel file and format it at the same time. However, my script only works when I execute it twice (or point it to an excel file that already exists). Any ideas on how to fix this? – I would like to slip in some python code to autofit the column widths in excel. The Microsoft.Office.Interop has a function worksheet.Columns.AutoFit() that should help with this, but I have no idea how to integrate that into the graph. Would it be best to edit the python code of the format code or better to make a new node? I have included my graph in a .rar file (to get around the upload attachment limitations) but that didn’t work. I can’t include links to dropbox either (spam alert). What’s the best way to share graphs in the comments? Screenshots won’t really work because the graph is too big. I would log the issues and feature requests here: https://github.com/ksobon/Bumblebee It should allow you to upload files as well. I had a question about the pie chart function of Bumblebee. I understand the default multiple colours for the data are randomised – is it possible to dictate what colours you want to use from a given colour palette. I am using Bumblebee to create a set of pie charts for work and need to keep to corporate colours. Any help/advice would be very much appreciated! Many thanks in advance! Do you recommend this tool to working on a set of Revit Sheets? I am looking for a proper solution how to import a big amount of data (let’s assume a hundreds of Sheets) from Revit to Excel. Update data in Excel and upload it again to Revit. To have a control on the whole data. Have you tried using Bumblebee in similar issue? 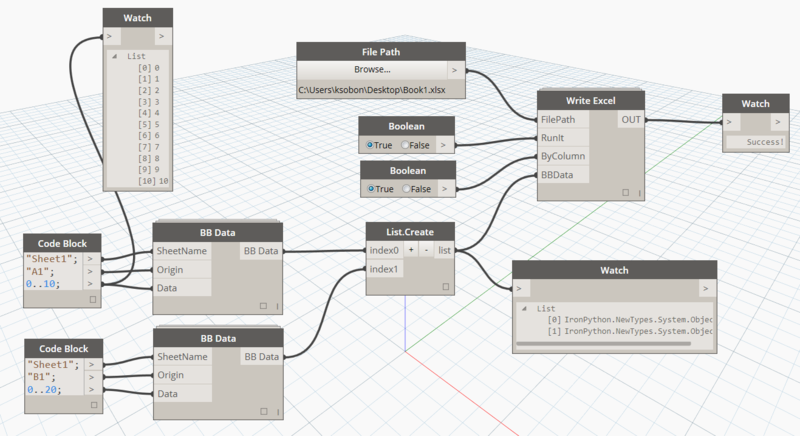 I would probably say that Dynamo is not the best solution for dealing with large amounts of data coming from Excel. It’s certainly possible and there are tools like Bumblebee that will handle it for you, but at the same time you should perhaps consider commercial solutions as well. I am Using Revit 2018.3 and My Dynamo version is 1.3.2.2480. Can you please tell me what is the latest version and link for Bumblebee. I want to highlight some Excel cells with some conditions but failing with the nodes. 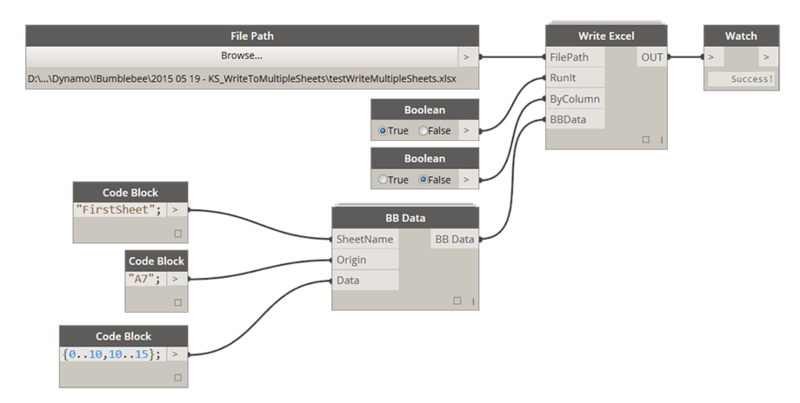 It appears that Bumblee’s “Write Excel” node does not work with a list input to the “BB Data” input parameter “origin”. This is also after adding the “import os” instruction to both the “Write Excel” and “Read Excel” nodes. I’d think that would have been updated since it was discovered over 3 years ago. I’m running Dynamo 2.0.2 and Revit versions 2017-2019. Can you post a link to a sample file that I can open, and re-create this issue?